Has it been really less than six months since the White House was invaded by terrorists? We had in Olympus Has Fallen the North Koreans attacking the U.S. in order to destroy their long-standing enemy. 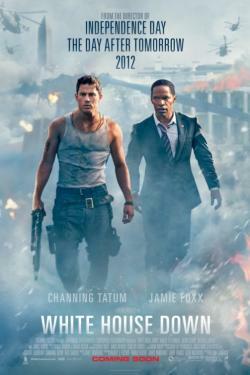 In White House Down, the enemy is within. I imagine that later on I might do a comparison between these two 'Executive Mansion Under Siege' films, but let us focus on White House Down. The film tries to be two things: straight-up action film and buddy comedy. In terms of the first it soon starts becoming so ludicrous and unbelievable that you have to wonder how anyone could survive all the things they did without nary a scratch; in terms of the second you think the jokes (such as they are) just don't fit. Also, White House Down suffers from a serious case of barely-hidden partisanship that is comes thisclose to being virtual propaganda. President Barack Obama...I mean, James Sawyer (Jamie Foxx), a Lincoln-loving Commander-in-Chief, has come up with a brilliant idea for Middle East peace: withdraw all troops from the region and focus more on domestic spending to provide all services to Americans. Sawyer can pull out of the Middle East because the Iranian President with whom he has been joyfully working with assures him that Iran has no nuclear weapons, no desire for nuclear weapons, and has no intention of harming anyone. Let's leave aside the sheer impossibility of THAT scenario, or that Sawyer's Middle East peace plan I think involves recognizing Palestine but doesn't involve Israel in any way. not based on ANY person, living or dead. While Obama/Sawyer brings world peace by renouncing the role of superpower, John Cale (Channing Tatum), who is security for House Speaker Eli Raphelson (Richard Jenkins) dreams of working for the Secret Service. Not just the Secret Service, but as part of the President's detail. He manages to wrangle an interview, but said interview is conducted by Carol Finnerty (Maggie Gyllenhaal), an old flame of the uber-hot Cale. It is convenient that Cale has the interview when he does: he just also happens to have gotten tickets for a White House tour which is about the only thing that impresses Emily (Joey King), his perpetually grumpy but Wikipedia-level nerd of all things White House daughter. Her knowledge both pleases and irritates Donnie (Nicolas Wright), the eager White House tour guide. It isn't soon until there is a massive bombing at the Capitol. Cale and his daughter are caught in the White House, which is put on lockdown. White House Security head Martin Walker (James Woods), who recently lost his son to the war Sawyer is ending, at first attempts to protect the President. Wouldn't you know it: Walker is part of a massive plot to hold the President hostage. Guess who is the only person around who manages to avoid getting hit by any bullet unleashed by the right-wing/racist militia that has taken over the White House? Guess who else happened to leave the tour to stop off at the restroom before the actual attack and puts information on her YouTube site? Now, John McClane...I mean, Cale, now has two tasks: to save the President's life (and thus show that he is more than adequate for serving as part of the Presidential Detail) and save his daughter (who up to now doesn't like him) from these evil racist Republicans who will stop at nothing to thwart the peace plan the cool-yet-intelligent black liberal President is trying to implement. We learn that Walker, a dying man, is really just a front for a more sinister plan, one that Cale and Sawyer uncover as they team up to among other things, blow up parts of the Presidential compound and surviving one massive explosion after another, until after an exhausting day where the Vice President is offed (a side note: the Vice President in Olympus Has Fallen was also killed off, and I wonder if that was a strange coincidence or a dislike for the person who succeeds the President), and the Speaker of the House must make life-and-death decisions. With President Sawyer alive and well, he can stick it to the military-industrial complex and make the world safe for Progressives. At the screening I attended the audience took it for granted that Jamie Foxx was playing President Obama. Again, we can quibble about how the plot A.) doesn't make sense (seriously, an American President who would not only happily negotiate with the President of Iran but also withdraw all American troops from the Middle East because no American influence plus Iranian assurances they pose no threat, nuclear or otherwise would naturally lead to world peace) and B.) veers between laughable (see A.) and idiotic (with explosions going off all over the place, neither Cale or Sawyer appear worse for wear). What really damns White House Down is that it is trying to be all things to all people: action, buddy comedy, political thriller, heart-wrenching drama, and it throws (and blows) so much on the screen that eventually the shifts become too silly to accept. One thing I just can't get over is that John McClane...I mean, John Cale, manages to not only overtake this cabal of racist/right-wing gun nuts (are there really any other kind?) single-handed, but that physically he doesn't suffer any real effects. The name John Cale, in case one hasn't noticed, is so surprisingly similar to a character from Die Hard, I really wonder whether screenwriter James Vanderbilt was even trying to hide the similarity between Tatum's dim character (is there really any other kind?) and the iconic Bruce Willis character (at least in the first three Die Hard films; can't speak for the others). The similarity between Die Hard and Die Hard in the White House is so great that pretending it does not exist is disingenuous...right down to his shirt. Finally on the screenplay front, the idea as to who the actual mastermind turns out to be is laughable. It is even handled badly: when the chief conspiracist is unmasked, it is accompanied by Herb Albert & the Tijuana Brass. Bad choice altogether. I want to address one thing about the Twenty-Fifth Amendment to the Constitution, which is used to inaugurate two Presidents in one day (topping William Henry Harrison's thirty-day tenure). It states that on the death or resignation of the President, the Vice President takes office. It also covers when the President is incapacitated, though the President would have to give written notice. In this case, the Vice President would be Acting President at least until the President's death is confirmed (WITH A CORPSE). Without a body, the Vice President cannot legally assume the office of the Presidency because there is no concrete proof that the President is dead. Once the Vice President becomes President, until a Vice President is selected the Speaker of the House is the next in line. Given that, the lack of security and the rather grandiose conspiracy depends far too much on everything going right when frankly getting the Senate to vote down the treaty would have been much simpler. I'll say this much about Channing Tatum, a man who has is the best stripper working in film today. As much as we (and I imagine, even Tatum) know that Tatum can't act, bless him for continuing to try. His blank stare and stilted delivery don't fail him here. Foxx makes Obama...I mean, Sawyer into a mix of comic foil and peace-loving gun-toting badass (an odd mix to be sure). Garcelle Beauvais is wasted as Michelle...I mean, First Lady Allison (one or two scenes at the most), which is no way to treat both a good actress like Beauvais and The (Alleged) New Jackie. The villains (Woods, Jenkins) are all appropriately villainous, chewing the scenery with aplomb. I will state that the subplot of Woods' character's motivation for revenge (the loss of his son) would have been not just enough to propel the story but also something that would have given a sense of tragedy to the conspiracy. Once you introduce the military-industrial complex, open racists and disgruntled ex-militia people into the mix, it becomes too silly to believe. Jason Clarke (an actor who is gaining popularity with me) is again wasted as the evil and unhinged ex-Navy Seal (are there really any other kind). The only good performances are King as the know-it-all daughter and Wright as the eager tour guide, who lent White House Down with both the human element and comic relief the film needed (despite the story taking itself so seriously with its ridiculous plot). White House Down has the flaw of never fully deciding whether it was going to be a straight action film or a buddy comedy with action in it. Giving the film's more and more outlandish action (to where you stop questioning the logic of it all), it can be entertaining if one doesn't think on it. Once the White House pool house explodes and Sawyer and Cale not only survive, but Cale in particular is not injured, I thought it wasn't just White House Down, it was IQ Down.